The Ferrari SA Aperta is expected to cost 400,000 euros ($538,000) in Europe. Normally, automakers unveil their new models at auto shows to lure potential buyers. With the limited-edition SA Aperta, Ferrari is doing exactly the opposite: showing potential buyers what they have just missed. Ferrari says its planned production run of 80 units already is sold out. In August, Ferrari offered private previews to customers at the Pebble Beach concourse d’elegance in Monterey, California, and at its Maranello headquarters in Italy. The SA Aperta, essentially a roadster version of the 660-hp 599 GTO, is expected to carry a price tag of 400,000 euros ($538,000) in Europe. The Aperta – which means "open" in Italian – comes with a softtop that the company says is "designed to be resorted to only if the weather gets particularly bad." The top also is intended for use at very low speeds for a Ferrari: less than 100kph (about 62 mph). The SA Aperta pays homage to Pininfarina, the Italian design house that styled nearly all Ferrari production models over the past 50 years. SA are the initials of Sergio Pininfarina and of his son, Andrea, who died in 2009 while driving a scooter to the company’s office. The company was founded by Battista “Pinin” Farina, Sergio’s father, on May 2, 1930. 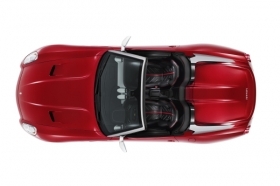 To celebrate Pininfarina’s 80th anniversary, Ferrari will build 80 units of the Aperta.